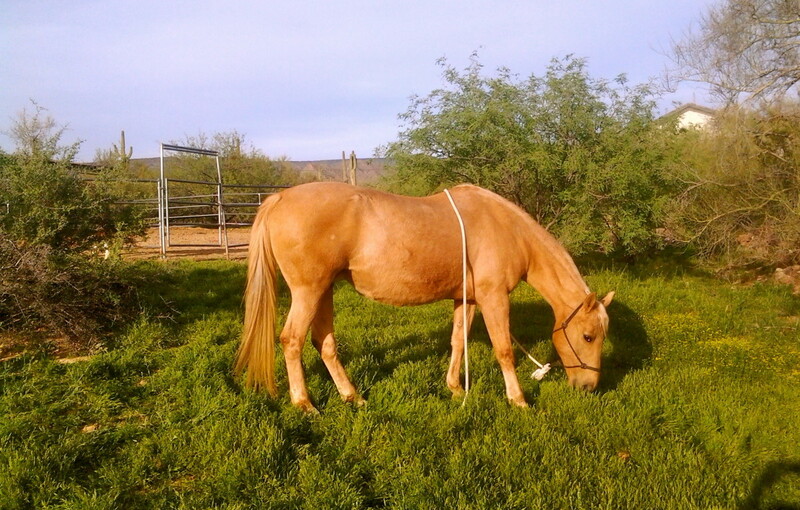 This two year old horse patiently awaits her debut in the show ring. A braided mane and tail will show her conformation at it's best. 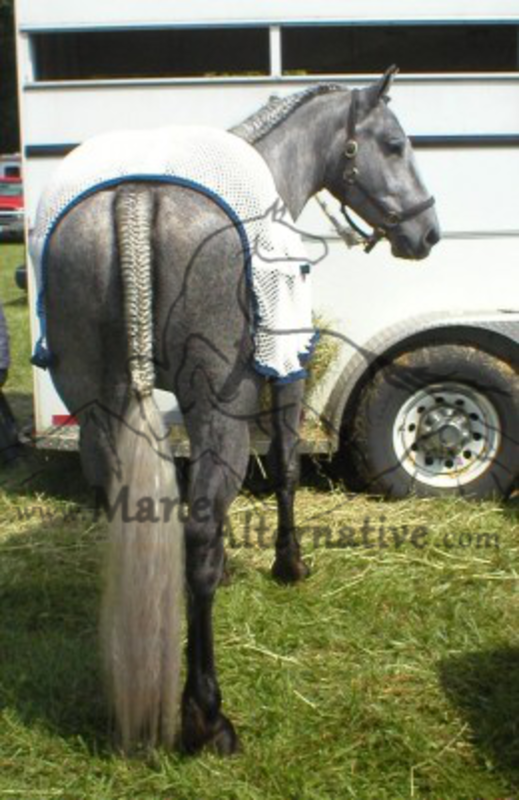 Traditionally, horses and ponies to be shown in English styles of riding and driving are braided for horse shows. 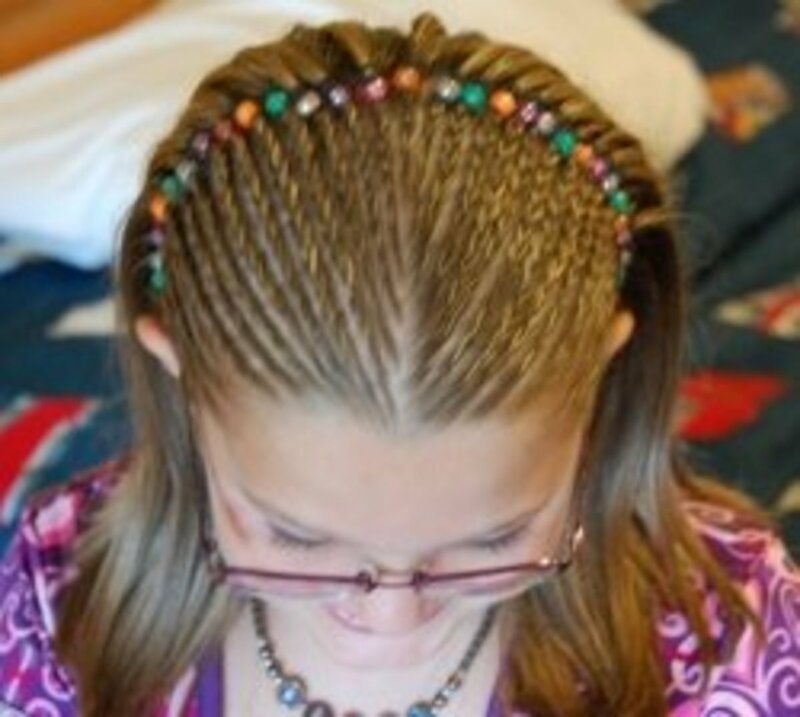 The braiding styles are absolutely beautiful pieces of art and many hours of love and practice have gone into producing them. Spectators at fairs and competitions are often kept at a distance from the horses for safety reasons, so here’s your chance to see up-close and personal what the braids in the horses manes and tails look like. 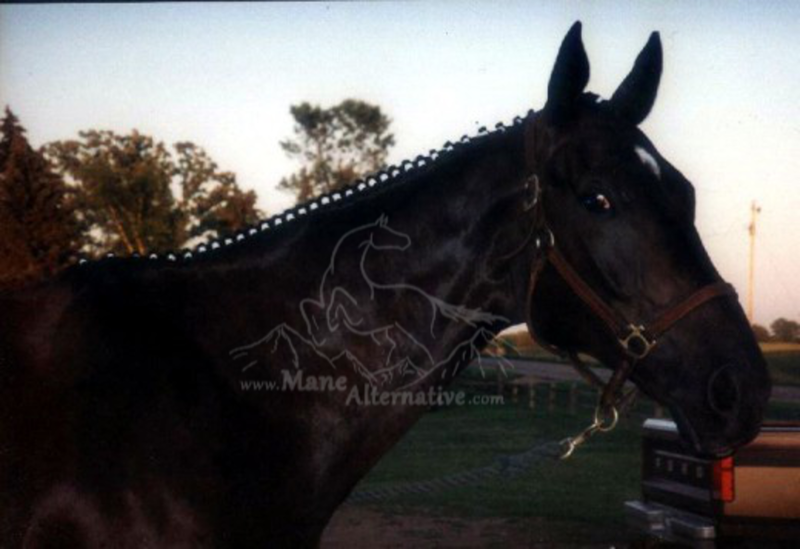 Here are a few styles of mane and tail braids I have done over the years. Enjoy! Copyright note: Please ask for my permission before distributing any of these photos. They are my own work and craft. 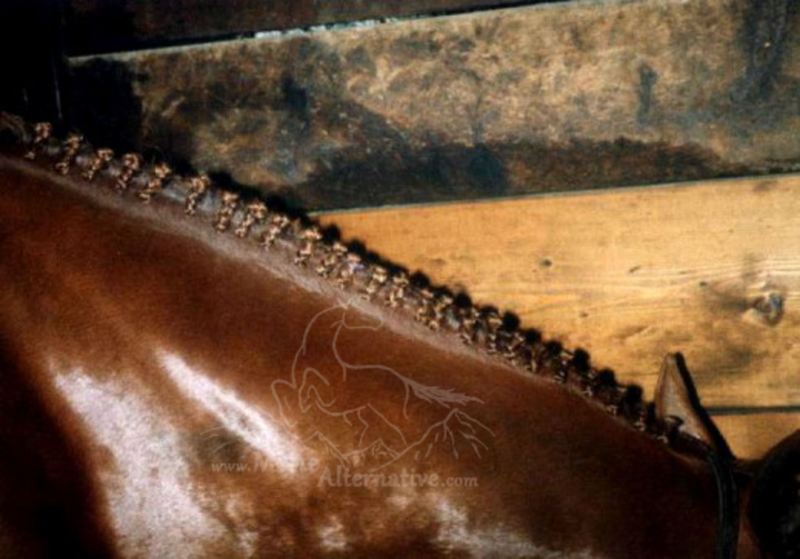 Aptly named, this is the most commonly seen style of braids seen in the Show Hunter ring. 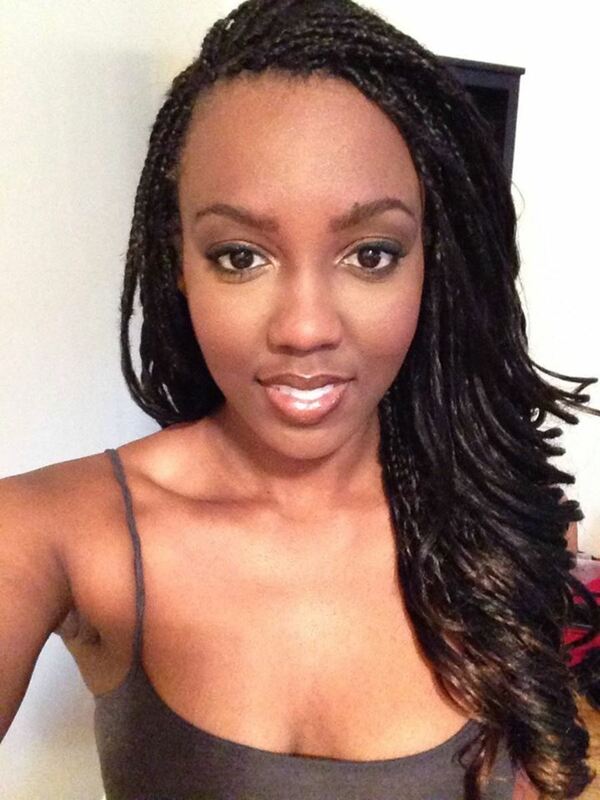 Occasionally referred to as Flat Braids or Bumped Braids - though those terms oddly contradict one another. 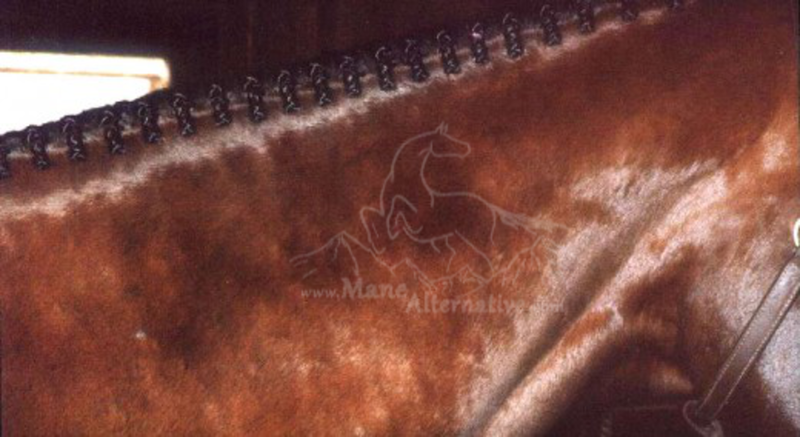 White yarn offers a subtle highlight to the neckline for this dressage horse. 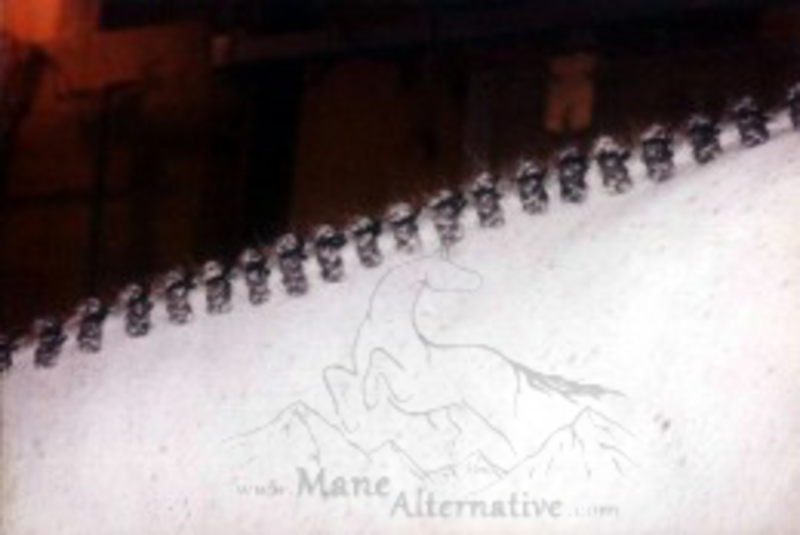 This Hunter style of braiding can easily be transformed into Dressage Braids by using white yarn for a subtle highlight to the horse or pony's neck-line, or by using white tape for a bolder statement. A splash of colored tape was added for this horse's fun class. Colored yarn added to Scalloped Braids for fun Musical Freestyle Festival. are beautiful and delicate. They are used in a variety of show rings and make for a very elegant neckline. In the right lighting they throw a pretty, laced shadow on the neck of the horse. Scalloped Braids - an elegant style. 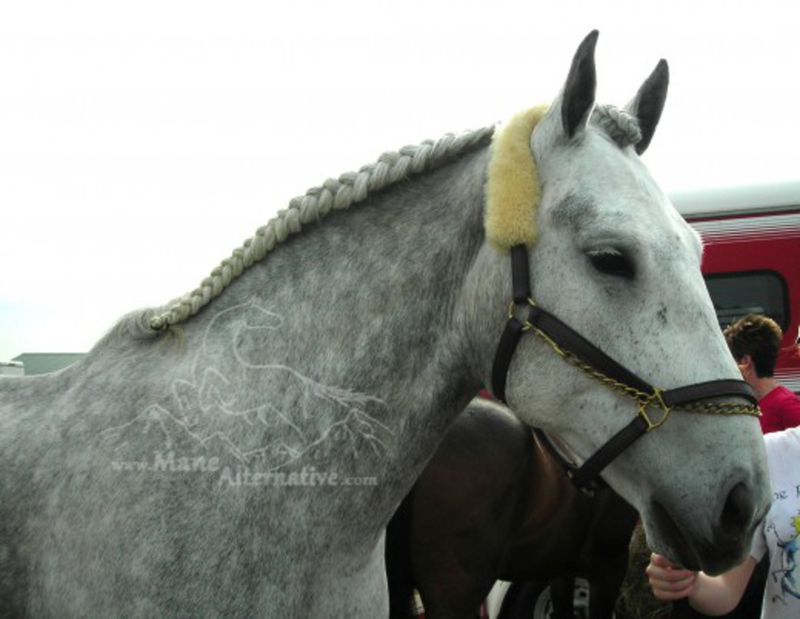 are simply neat, tidy and the most authentic style of any mane braid. They are truly a classic: seen in many disciplines of English riding, they are really making a comeback here in the states! 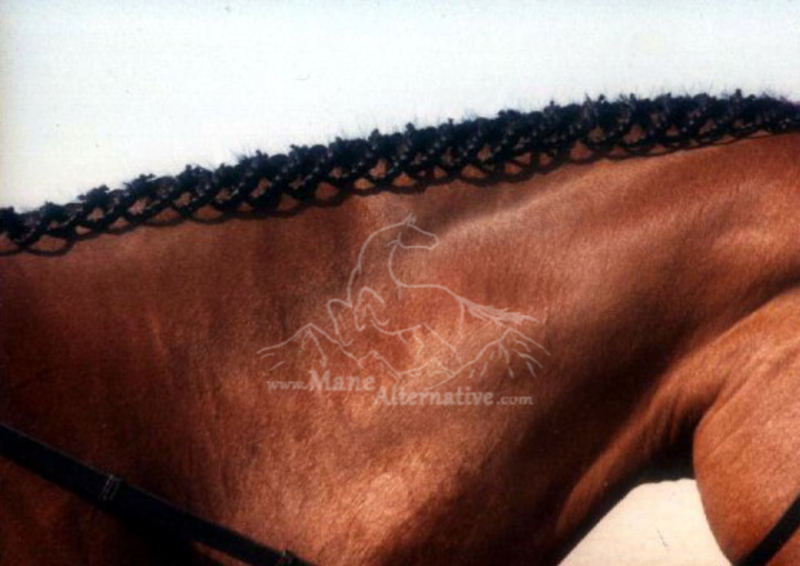 Traditionally sewn into the mane with needle and thread, the Button Braid has taken on few different forms over time by the use braiding elastics or yarn to achieve a similar look. Therefore, this rounded style has inherited several names: French Knots, English Braids, Hunting Braids, Australian Rosettes, and probably many more! Seems as though each country would like a go at it. French Knots on "Boy George". A gorgeous choice for his neck. Sometimes referred to as a Running Braid or Spanish Braid, this style can be sported in competition as well as being a fast way to tie their mane up for riding on hot days. 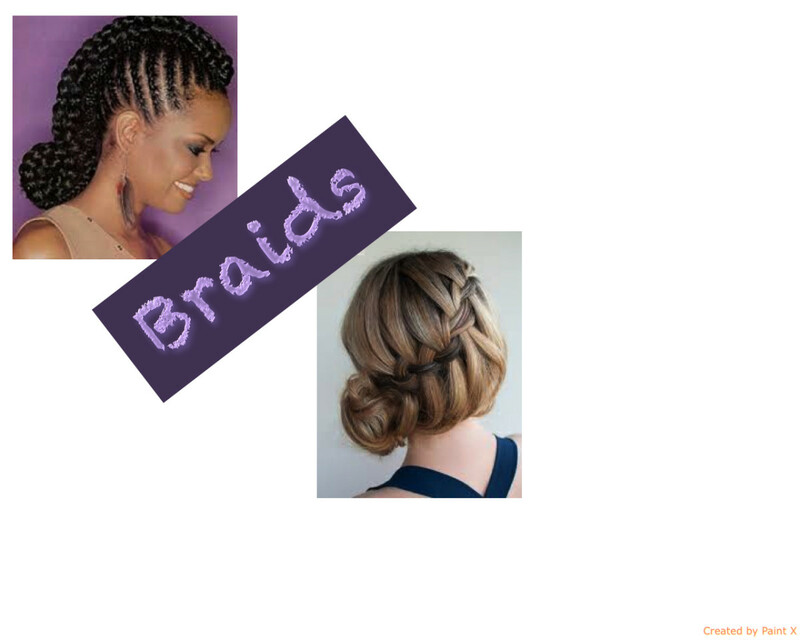 The French Braid can be done in a variety of ways and done tight to the neckline or draped. Shown here are: the original, the Inverted French Braid and my own Alternative Braid which is perfect for the extra long manes of the equine world. Fresh from his bath, this lovely Friesian Stallion is ready to show with my "Alternative Braid". is a pretty option for long manes allowing them to be competition-worthy yet flow freely and show their beautiful length. 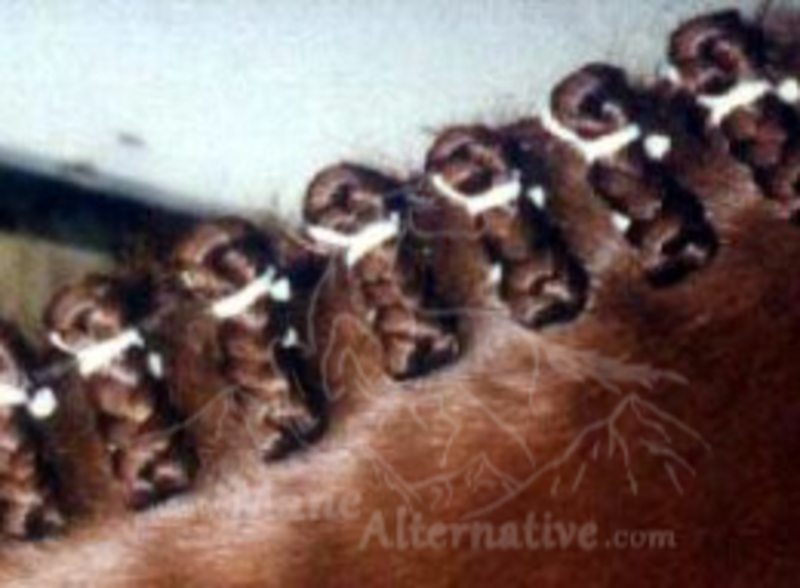 Because it is not really a braid, it is often referred to as a Diamond Weave or Woven Mane. 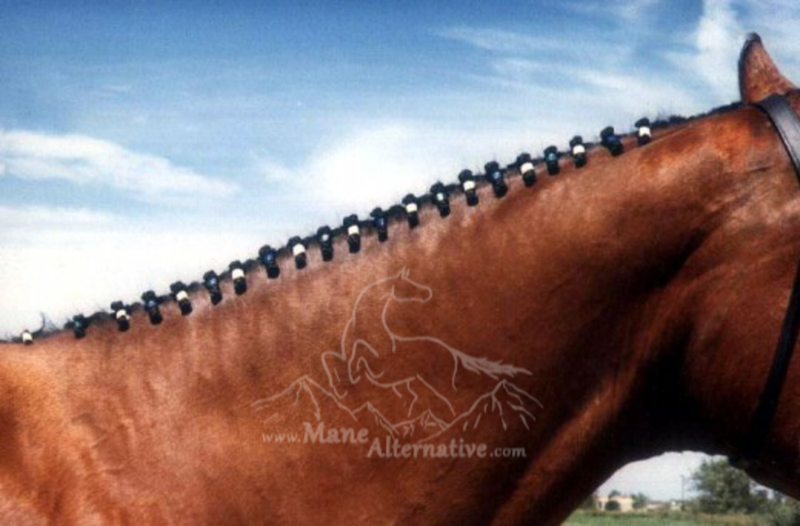 I hope you have enjoyed my tour of beautifully braided manes! 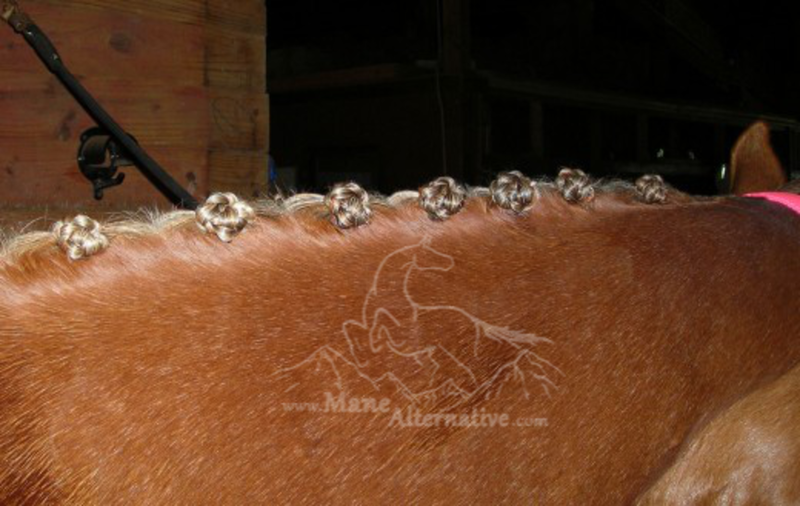 If you already show horses, braiding is a great skill to learn. 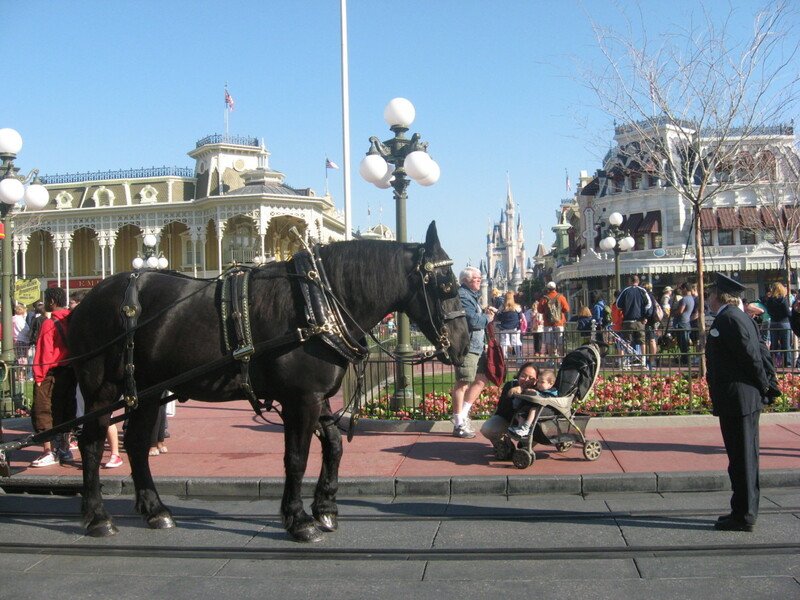 You will not only to save you money by not having to hire a professional braider, but you can also make money by offering your services to the horse-showing public! If you are interested in learning these braiding skills and other show grooming tips, please request it below and also check out my blog,The Mane Alternative. 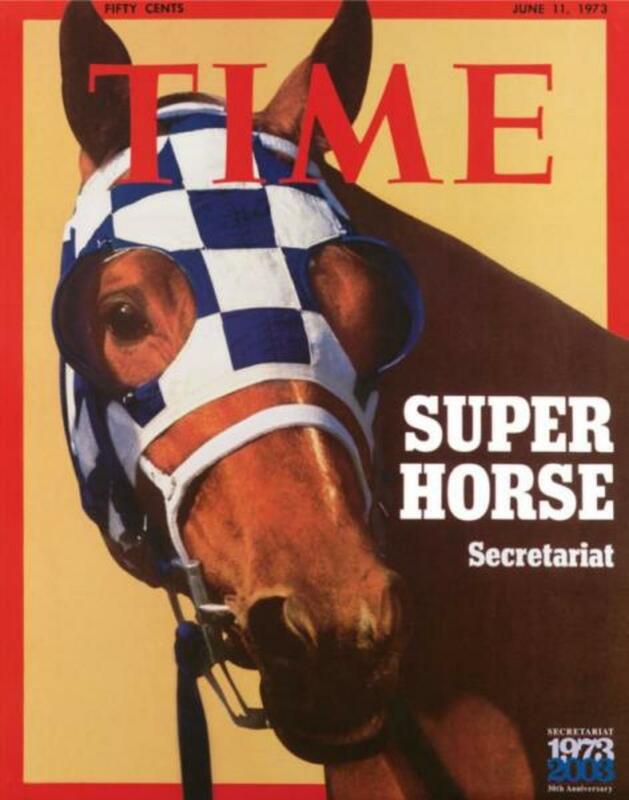 I will be adding articles often with show-season upon us! ...And yes, you CAN learn to braid! I have taught hundreds of people who thought they were “all thumbs.” Some have walked right into the show-ring the same day with their own braiding! Pictured below is the result of one lesson, ON show day, headed to the ring for her rated hunter division. My student's 1st time braiding, and heading straight to the show ring! My inspiration when I was a little girl...Incredible books to set out on your coffee table! Cool. Glad to be of assistance! What was your project? Very interesting and a blast from the past. 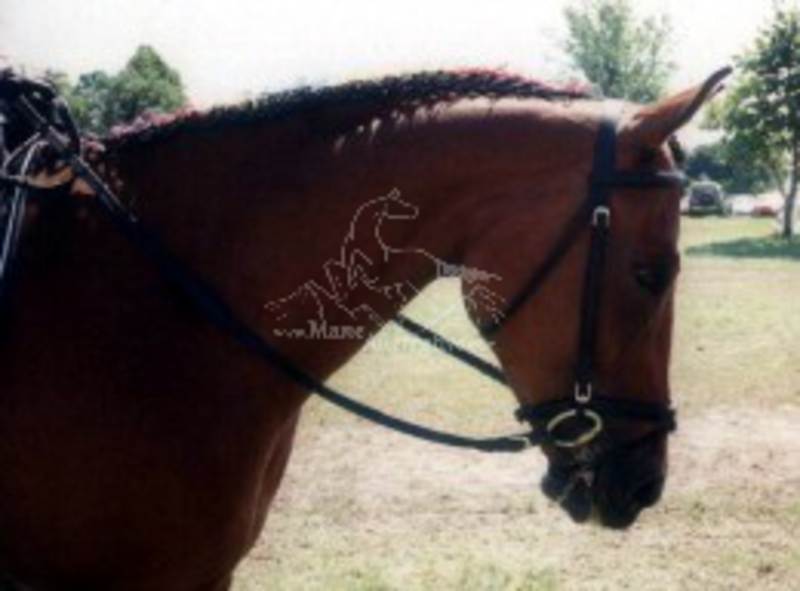 I used to show hunter jumpers and braided their manes as well as those of friends ponies. It's very relaxing to loose yourself in thought while you brad manes and tales. Thanks for sharing. Voted thumbs up and interesting! Thanks Suzanne! No hurry. I'll wait until you post. 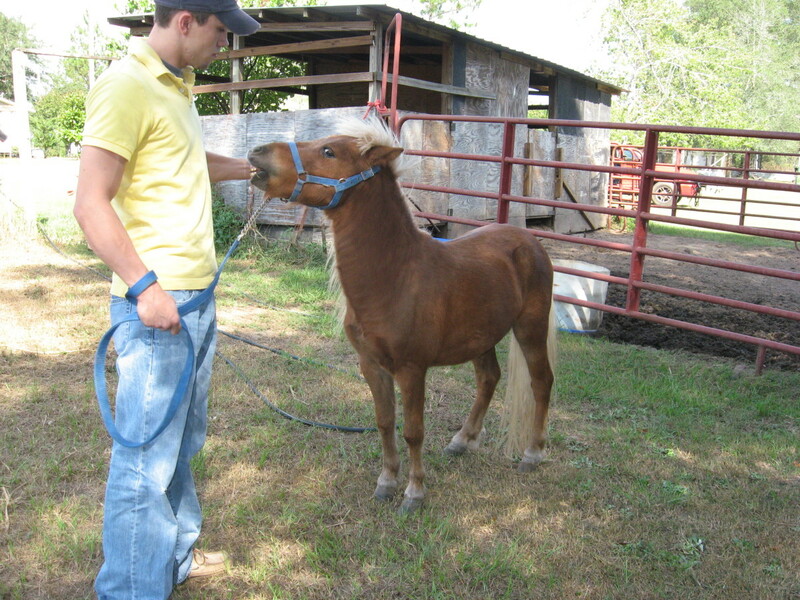 I wanted to follow your Hub on Horse braiding so now I'm a Hubster! I asked about the Polo Pony "Mudknot". Let me know when you have this posted. Thanks for answering! Just wanted to let you know that I thought your pictures were beautiful! 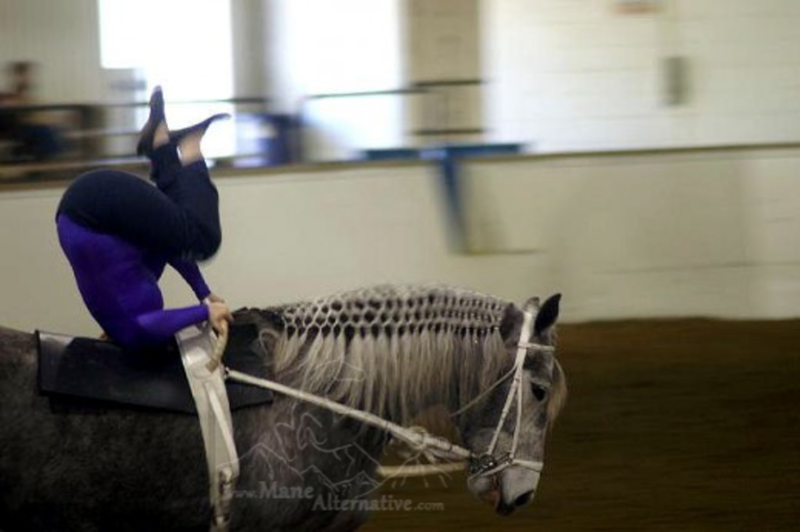 I am excited to try a few of these briads on reining horses! I'm curious though...do you have photos, instructions on the polo pony's "mud knot"? 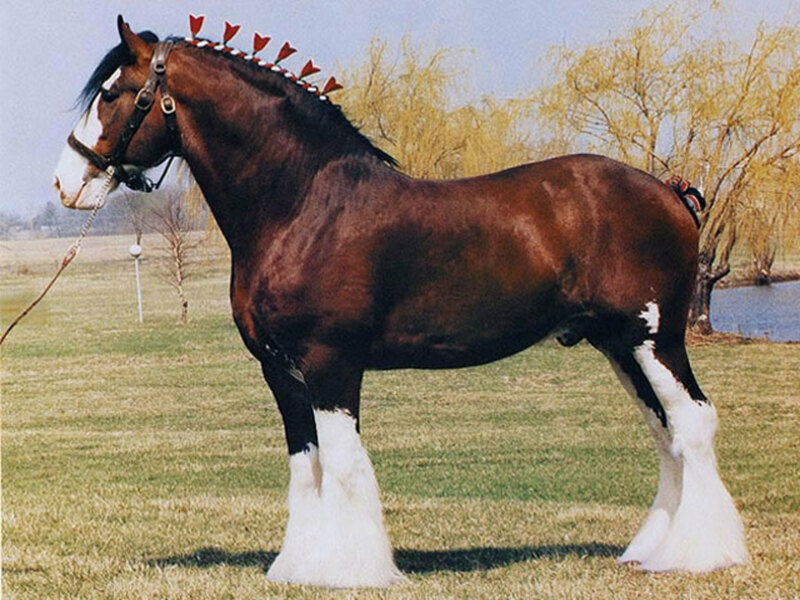 This is one we think might work for our horses. Thanks Suzzanne! 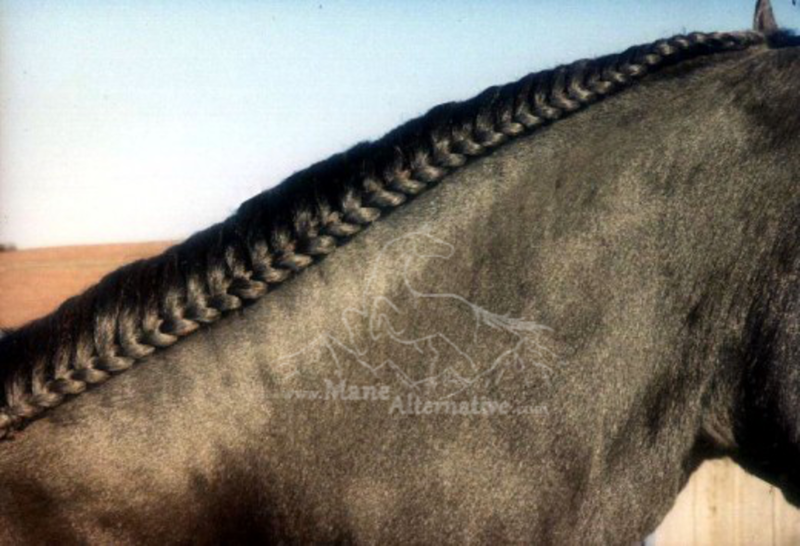 These braided manes are incredible, it must take hours to do that. 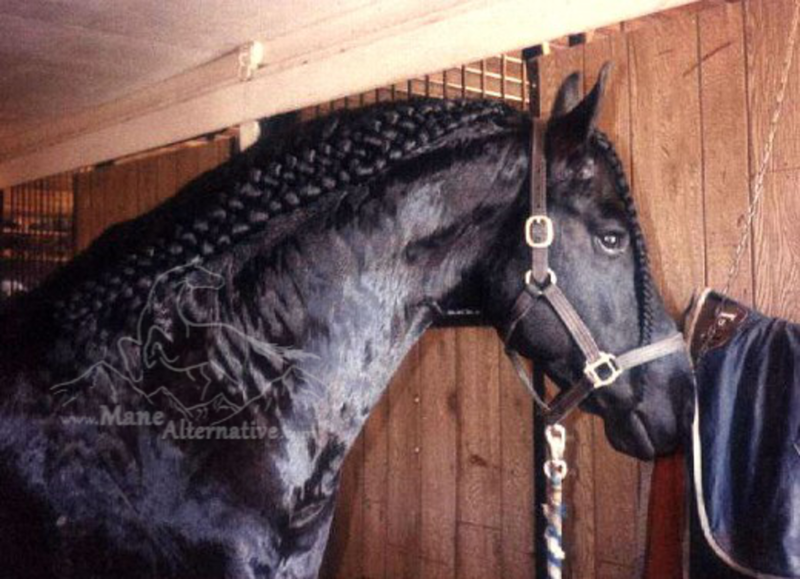 Thanks for sharing, I had seen some braided manes, but never any as elaborate as these. Hi Sarah. Thanks for your question. You made me smile because that was my favorite too. I read it from cover to cover and gazed at the pictures hundreds of times!! I tried to post it, but couldn't for some reason. So, YES it is available. Go through one of his book links above and type in the search "All Those Girls in Love With Horses" - it will pop right up for you! Can u still sget Vavra' book, the Girls Who Love Horses? -something like that..Mine was ruined years ago and I loved it.